Classic Spinach and Artichoke Dip is one of our all-time favorite dips and is perfect for serving on game-day, or at a party, or just a fun, relaxing day home with friends and family. 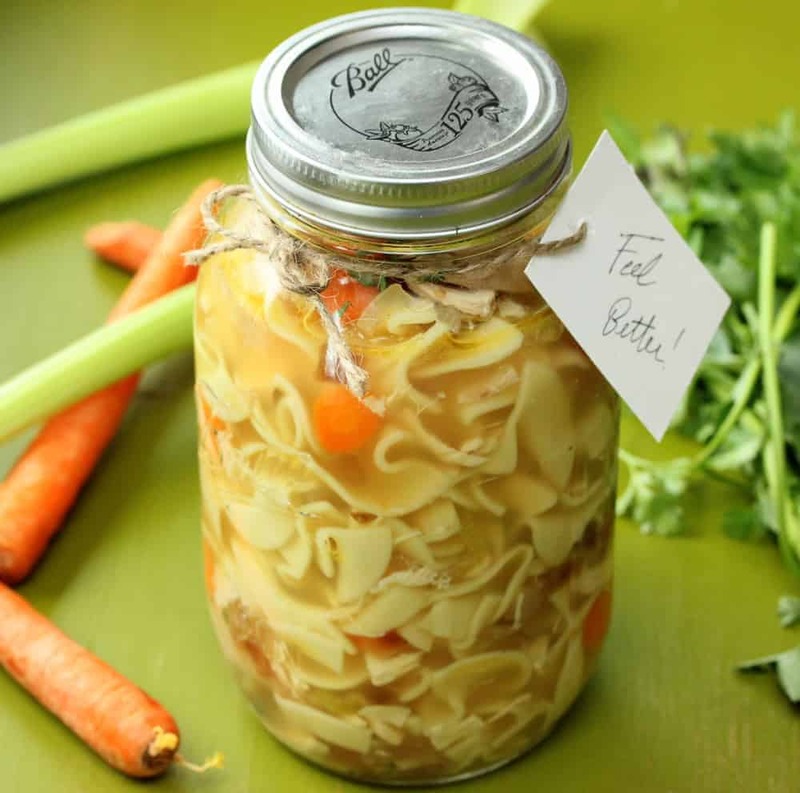 You can never go wrong with this heart-warming dip. 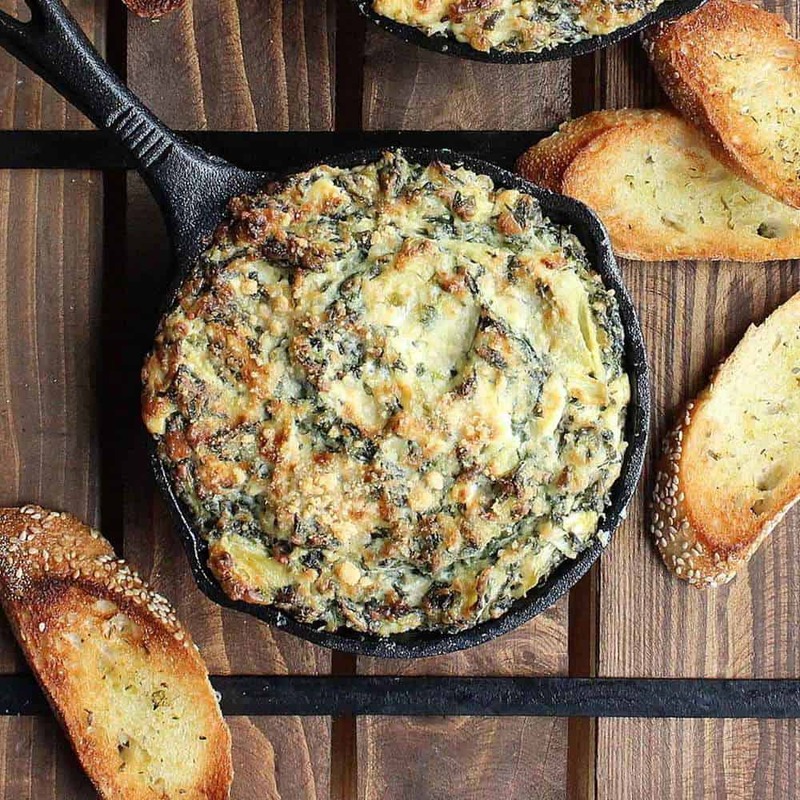 This Spinach and Artichoke Dip brings together such amazing flavors. 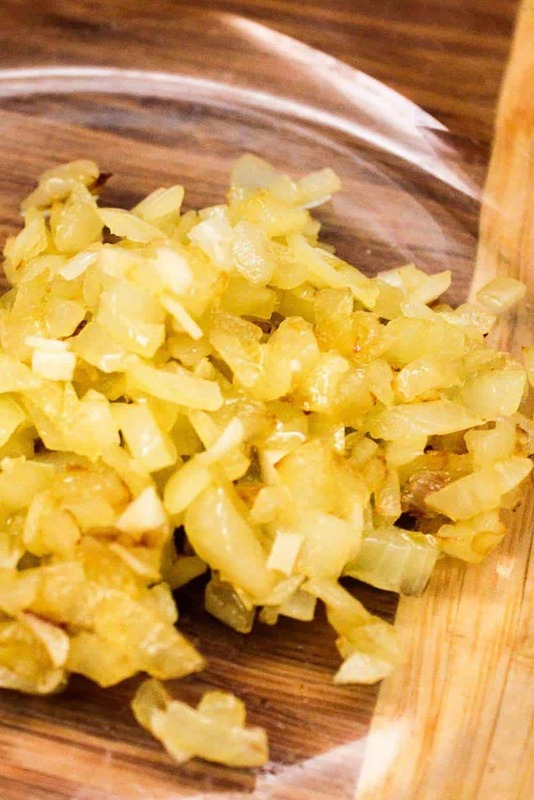 We absolutely love sautéing some yellow onion to deepen the taste of this glorious dip. Mmmmm…sauteed onions are so yummy. Folding in the cream cheese is when the party starts going. Make sure the cream cheese is at room temp, so plan accordingly! 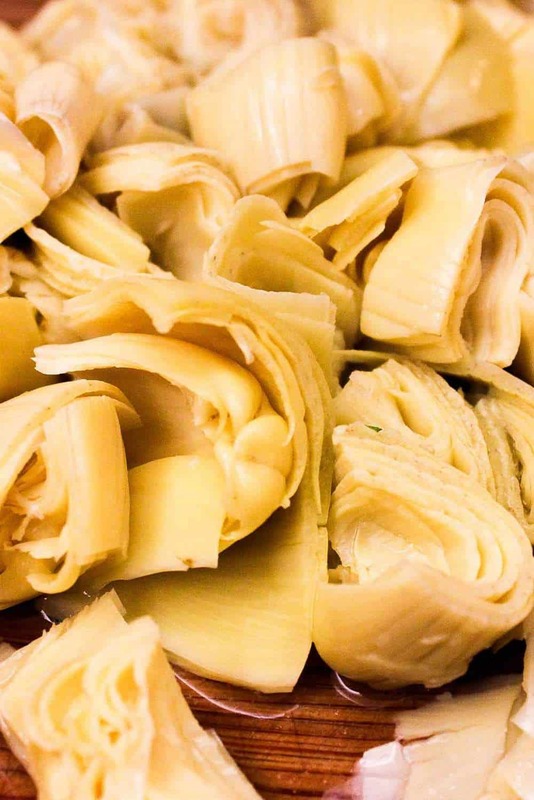 And we can’t get enough of artichokes. You can get the canned artichoke hearts or you can find them in the frozen section. Of course, you can use fresh, and steam until fully cooked, then remove the hearts. But in our testing, we find the canned or frozen variety work just fine for this deep. Now what would a Spinach and Artichoke Dip be without spinach? Well, quite frankly…not very good and very misleading! Again, you can easily go with frozen chopped spinach, or you can grab 12 ounces of baby spinach and cook it for 1 minute in boiling water, and then rinse and drain it. Either way, spinach combined with cheese and artichoke is pure dip perfection! This is really such a crowd-pleasing dip. 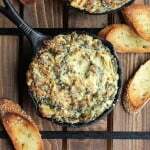 Classic Spinach and Artichoke Dip has been a dish we have been making for many, many years. 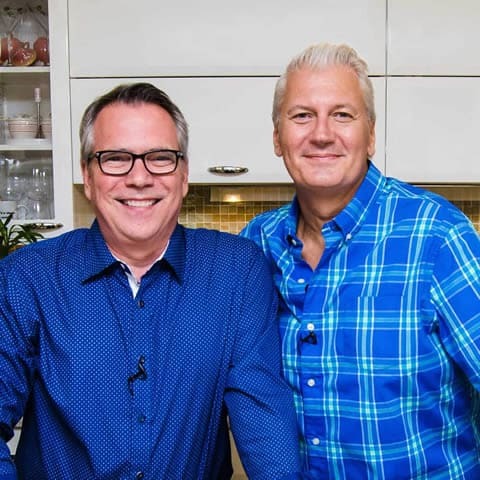 It is so easy, and can easily be prepared hours ahead of time, and then put into the oven about 30 minutes before your guests arrive. Serve with toasty French bread (with olive oil and dried oregano), and watch this incredible dip go so fast as you guests devour it! 100% Loon Approved! 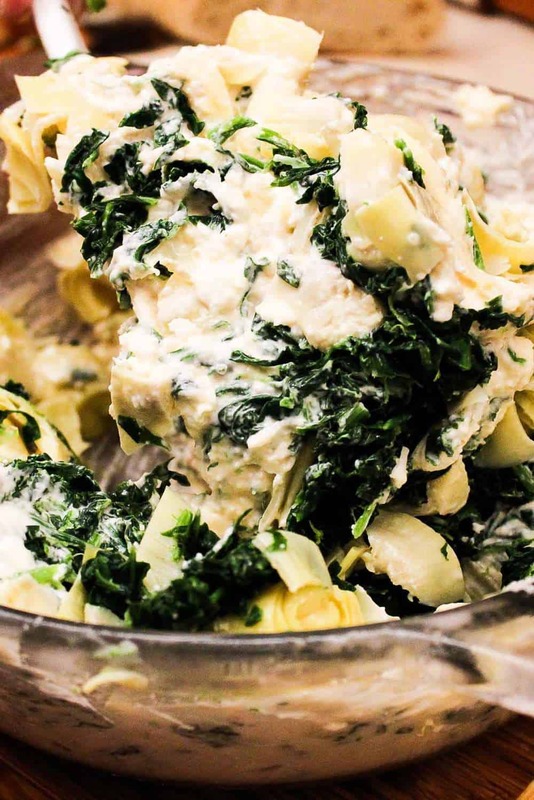 This Classic Spinach and Artichoke Dip is so loaded with flavor. Serve this with toasted French baguette slices, or crackers, and watch how fast this appetizer will go as guests arrive. So yummy! A Loon Favorite! Position a rack in the center of the oven and preheat the oven to 350 F.
Lightly oil a baking dish that holds about 6 cups. Heat the oil in a separate small skillet over medium heat. Add the onion and cook, stirring often, until softened, about 3 minutes. Stir in the garlic and cook until fragrant, about 1 minute more. Transfer to a medium bowl and cool slightly. 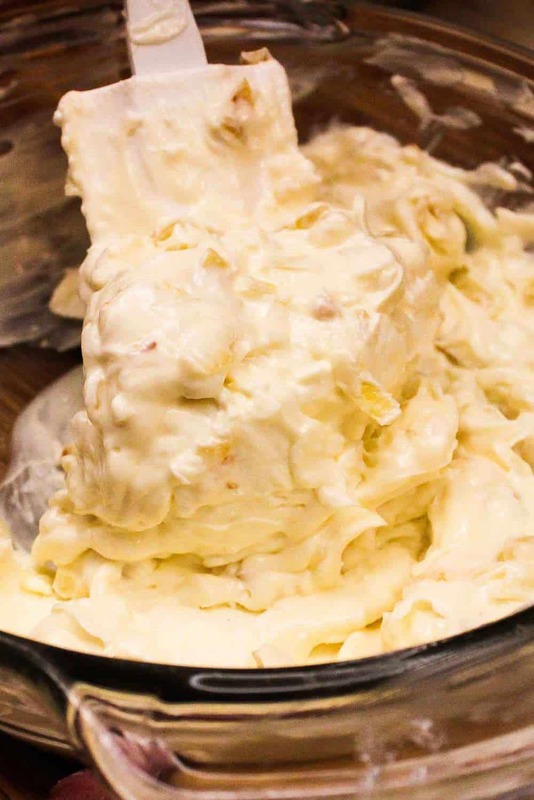 Add the cream cheese and mayo to the bowl and using a spatula, mash them together to combine. Add the 1/2 cup of the Parmesan, the Romano, and hot pepper sauce and mix well. Squeeze the excess liquid from the spinach, and then add to the cream cheese mixture. Add the artichoke hearts and mix well. Bake until the dip is bubbling and browned, about 35 minutes. Serve with toasted baguette slices (brushed with olive oil and sprinkled with a little oregano before toasting under the broiler). Oh cheesy goodness! This looks SO GOOD! 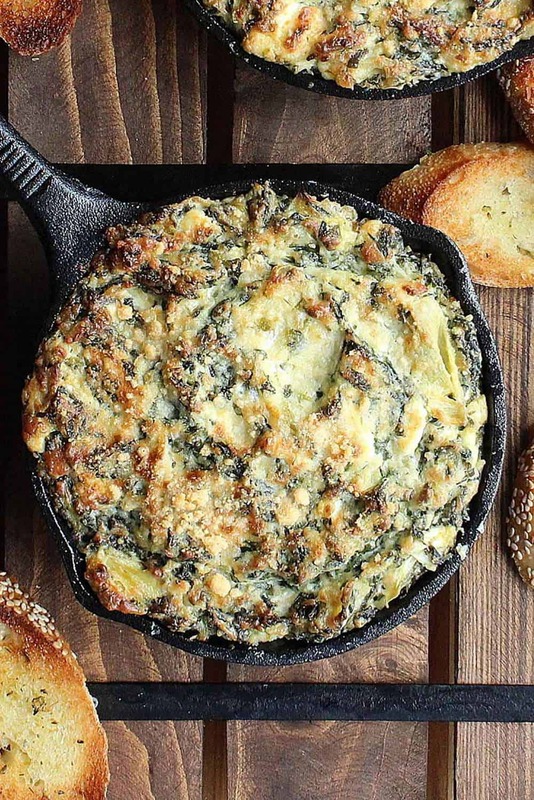 I love spinach artichoke dip, but never made it at home. Bookmarked and made for later.